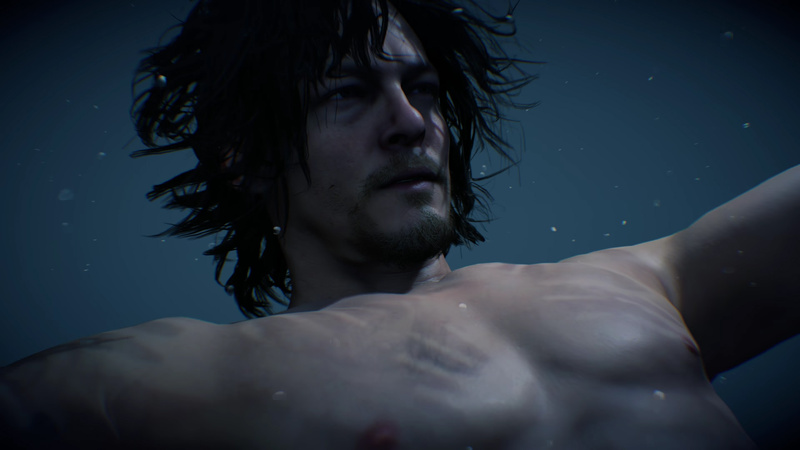 The last several days have been rich with theories for Death Stranding as fans continue to single out details from the most recent showing and try to compare and contrast them with clues hiding in previous trailers. I'm not sure I am any closer to understanding this video game in which a baby inside of Norman Reedus gives a thumbs up, but that kind of doesn't matter. I'm happily along for the ride. In an interview with IGN, director Hideo Kojima was surprisingly forthcoming with new insights. "Death will never pull you out of the game," he says, noting that the surreal underwater sequence from the latest trailer is where players go when they die. While here, you'll be able to explore outside of your body from a first-person perspective. "At that point, you're not dead or alive. It's the equivalent of that screen that says 'Continue?' and a counter ticking down towards zero." Continuing that train of thought, Kojima explained how "in the trailer, you saw the crater, and when you come back, it's still there. Most games would've taken you back to before the crater was made. So depending on the player, you might have a lot of craters all over the place -- depends on each player." The biggest surprise, at least for me, is the mention of "Timefall," a sort of otherworldly rain. It's what made the plants grow and shrivel, and also what rapidly aged the crushed man in the trailer. In retrospect, it seems so clear. "Most people in the game are aware of the rain -- and well, Norman is quite unique in this regard," said Kojima. "I think I should stop there. I'm spilling the beans." It's worth reading the full interview for even more details about where the newest footage falls chronologically speaking (it's early on in Death Stranding) and what's up with the baby (it apparently "relates to game mechanics as well as the story as a whole"). As for what's next, the team is "waiting for the right moment to show gameplay, but right now we're on track with the project."